Chum | Keep It Up, David! I did a lot of cooking over the weekend for an event on Sunday night. The event was built around watching a wonderfully terrible straight-to-DVD film called “2-Headed Shark Attack,” which is very appropriately named, because it’s about a 2-headed shark that attacks. Luckily for the shark, there just happens to be a boat full of muscular, big-tittied, dumb college kids that end up becoming a delicious 15-course meal. The movie stars Carmen Electra as some sort of doctor with a fondness for posing while tanning (I may have missed what kind of doctor she is, but other people call her ‘Doctor’ and at one point she’s holding a first aid kit), Brooke Hogan as a plucky student who is adept at engine repair and underwater welding, and Charlie O’Connell as the boat captain and professor of the semester-at-sea program the kids are all enrolled in. This blog isn’t about movie reviews, but I will say that “2-Headed Shark Attack” is silly, stupid fun. I definitely had a good time watching it, and it was definitely worth the $1.31 that was spent renting it at Redbox. Don’t expect any Oscar nominations – instead, expect plenty of unintentional laughs because the writing is atrocious, the acting is hysterical, and the movie is full of mistakes (including severed limbs that reappear, a shark that conveniently changes size depending on where it’s attacking, and my personal favorite: fake shark teeth that are clearly made of foam, because they bend). Back to the food. I did the cooking for the evening’s festivities, and I decided I would theme all the food around the aforementioned cinematic masterpiece. I made three dishes, the first of which I’ll share today (I’ll share the other two later in the week). I decided on a relatively simple, healthy menu: soup and salad. I actually made two soups, one hot and one cold. 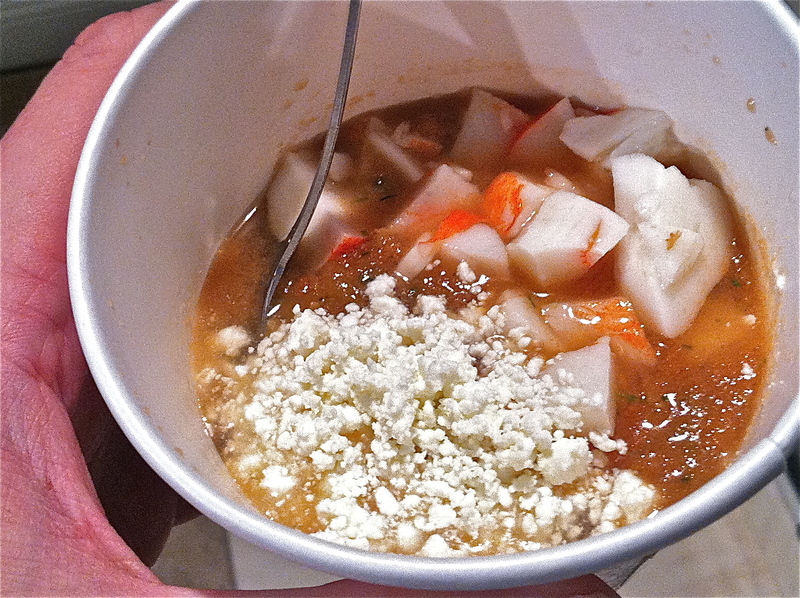 For the cold soup, I made a gazpacho, and, in honor of “2-Headed Shark Attack,” I renamed it chum. I based my gazpacho on this watermelon gazpacho recipe by Food Network hottie Tyler Florence, but I modified it, like I always do. The first modification was to quadruple the recipe. First ingredient: 8 cups of watermelon. After disassembling a mini seedless watermelon, I discovered that the entire watermelon yielded slightly more than 8 cups – it was around 9 and a half – so I just used it all. What the hell. Before I go further, I should say that everything ends up getting pureed in a blender, but since I quadrupled the recipe, I had to blend it in batches, and then mix it together in a big pot. 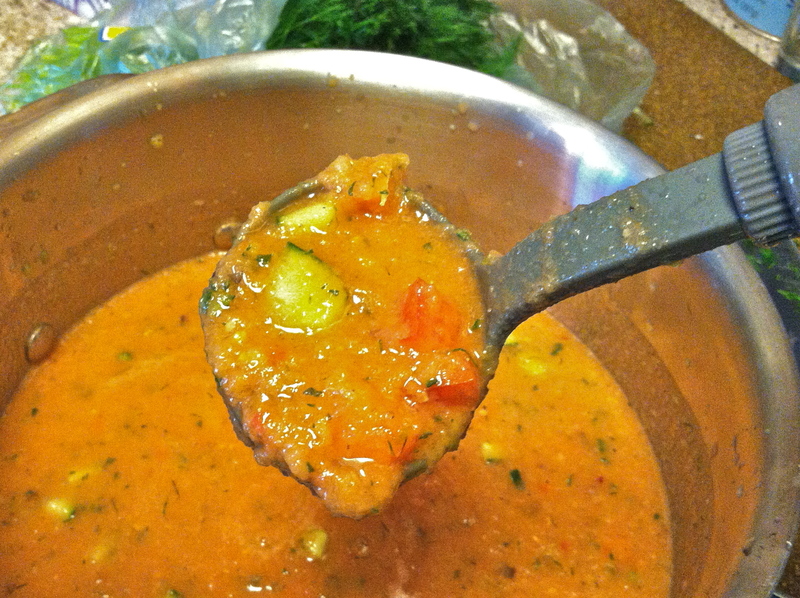 And since I wanted the chum to have some texture, I reserved about a cup of each of the main ingredients (watermelon, tomato, cucumber, and a little red onion), chopped them finely, and added them to the pot without blending them. So, after cubing a watermelon, I rough chopped 4 large tomatoes, and then got out two serrano peppers. Serranos have a good amount of heat, but like most hot peppers, most of it is in the ribs and seeds, so I removed those. 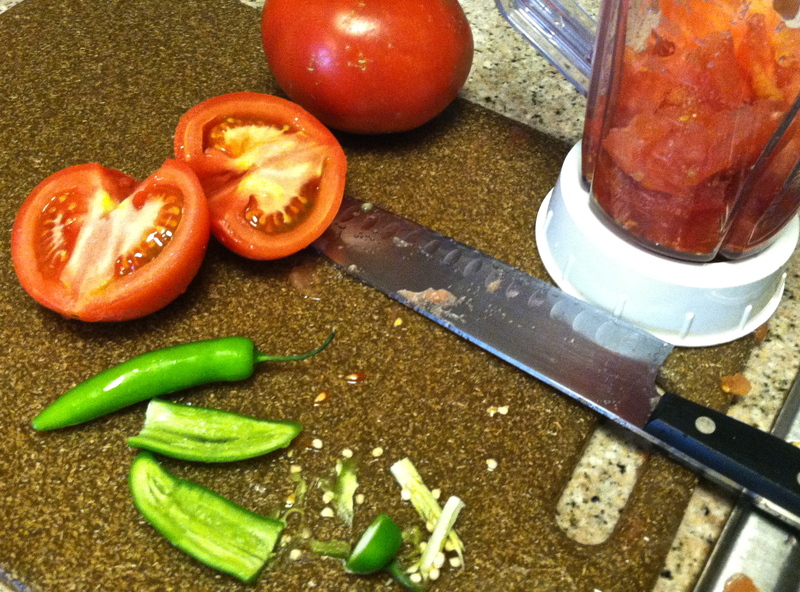 I also minced the serranos pretty finely – I trust my blender and all, but I wanted to be certain that no one got a big hunk of serrano in their soup. 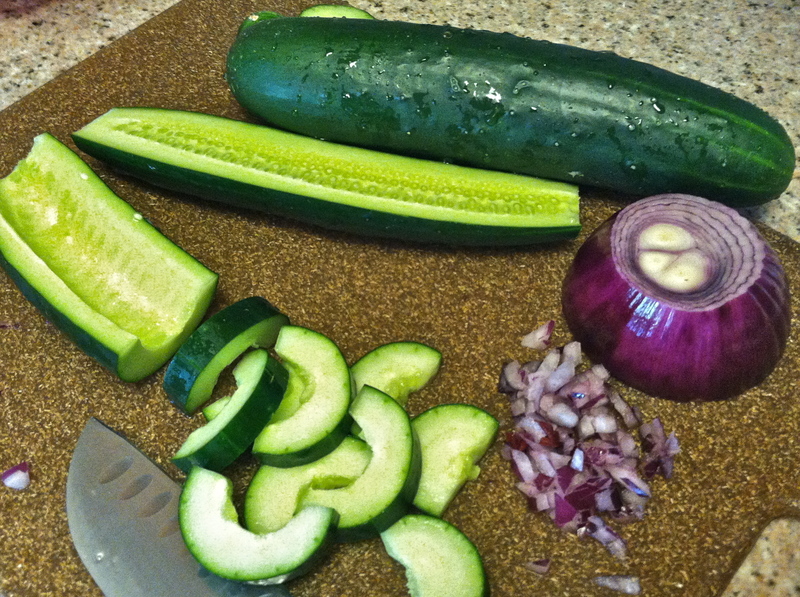 Next up was de-seeding and chopping two cucumbers (you de-seed them by chopping them in half the long way and using a spoon to scrape the seeds out of the centers), and chopping 1/2 a red onion. Then I started blending. My blender works best when there’s some liquid in there, so I added the wet ingredients to the first batch. Quadrupling Tyler’s recipe means you’re supposed to add a full cup of olive oil… NOPE. I’m not adding a full cup of oil to anything if I can help it! I ended up adding a little less than 1/4 of a cup, and compensated by adding more red wine vinegar (5 tablespoons instead of 4 teaspoons). Once I had the first batch blended into a liquid, I transferred it to the pot, but I left about a cup of the liquid in the blender, to help get the next batch started. I did this until everything was blended (which required 4 or 5 batches). I also added, in one of the latter batches, a few handfuls of fresh dill. After it was all blended and in the pot, I added the finely chopped ingredients I had reserved earlier, and stirred it all up. Looks very chummy! The chum was delicious. 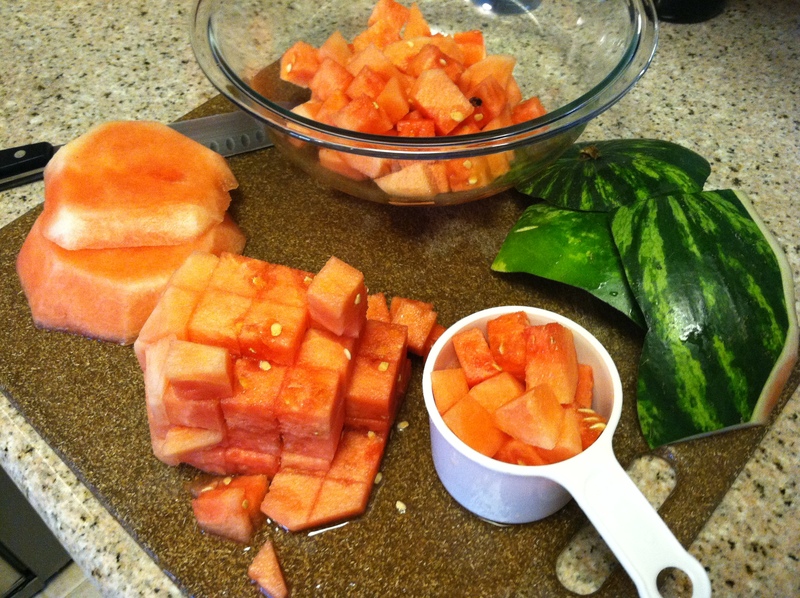 The watermelon added some sweetness but it wasn’t overwhelming, and the sweetness was balanced out by the heat of the serranos. It was rich and packed with flavor, and, best of all, it was pretty easy to put together – unless you don’t like chopping. Coming later this week: my Shark’s Tooth Salad and my 2-Headed Roasted Broccoli Soup! FUNDRAISING UPDATE: I’m now less than two weeks away from the Fight for Air Climb 2012! After upping my fundraising goal multiple times (from $100 to $200 to $500 to $600), I recently upped it one final time – to $630, which is $10 for every floor in the 63-story Aon Center. CLICK HERE to learn more about my skyscraper climb, including the link for donating – Thanks to a bunch of generous readers and friends, I’m now only $30 from reaching my goal! This entry was posted on Tuesday, March 20th, 2012 at 11:53 am and is filed under Uncategorized. You can follow any responses to this entry through the RSS 2.0 feed. You can leave a response, or trackback from your own site. I’m going to “pin” your recipe because it sounds SO good.